I’ve been sitting on this project for over a year now but am very excited to post it today. 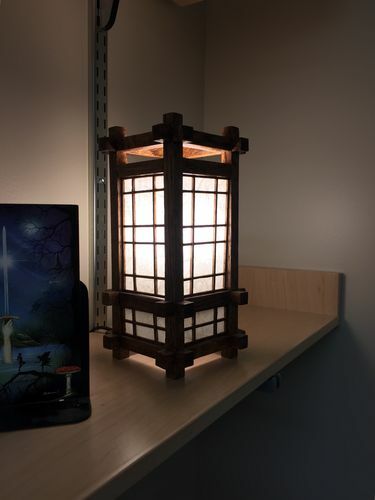 I built the first lamp a few years ago after seeing a puzzle joint in popular woodworking. I thought it could be put to use on something more interesting than a puzzle. I’d also seen a project here on lumberjocks that had a similar style to this but the creator didn’t share how he made the joints so this was my take. I was very excited to have Canadian Woodworking and Home Improvement Magazine agree to publish an article on this lamp and you can find the full build details on their website here and in print on magazine racks. This is my first magazine article and I can’t quite believe it. I built the lighter coloured lamp first, I think it might be alder, not sure as the wood came out of a dumpster. The second lamp, the one that was built for the magazine was made from oak. congrats on being published,i checked out the mag you did a great job showing the build process.that twist to lock joint is very cool.of the two i kinda like the darker oak better myself,i just wish i had a place to use some.very nice work. Well done! The lamps are beautiful and the joinery is awesome :-) Congrats on being published too! This is so cute…magnificant design, I bet it looks awesome in dark lighted. Very beautiful work. And congrats on a published article, something to be proud of. I have seen lamp similar on Pinterest, yeah I look there for inspiration and ideas. Would like to find a nitch to get into to supplement income down the road. I have not looked at the article yet, but need to. Question though. I have seen a design, think it’s called kioloe (spelling ?) But it appears that it is more of fitting the pieces together with fine cuts for the exact fit. You stated joints that twist and lock. Is this anything like what I explained? Japanese woodworking is interesting. I would like to learn more about the subject. Great article. Looks fairly easy to build. I may have to give this a try, I have some scrap wenge pieces which would fit the bill. Hey Eric – I’m definitely no expert on Japanese joinery so I don’t know the proper terminology for what this is (or if it even is a traditional Japanese joint). You are right that this project relies on tight fitting joinery as there is no glue (except to hold the paper shades to their frames. Very nice lamps and congrats on the Woodworking article. Awesome lamps and the fact that you got published adds the cherry on top!